Site managers and supervisors are constantly looking for creative and engaging ways to impart crucial safety tips for work and ensure employees avoid workplace injuries. Everyone on the team needs to be involved, and that starts with training. 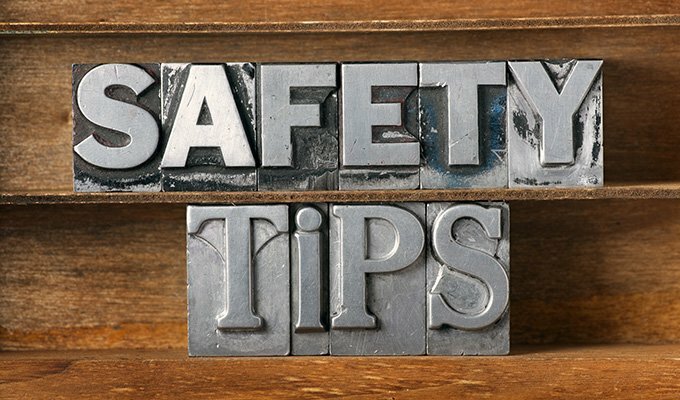 These safety tips for the workplace encourage everyone to make safety a top priority, motivating the whole staff to keep an eye out for each other. Safety management has to be just as important to your employees and staff as the quality of their work. The more conspicuous, the better. Post your safety tips in locations where employees are likely to see them. This makes it more likely that everyone will, over time, memorize them. Use professional designers to create colorful graphics and posters that include your top safety tips for working in a warehouse. Even the most detail-oriented safety managers may miss a spot, so to speak. For example, even after completing countless warehouse walk-throughs, there may be areas of the floor that are extra slippery on rainy days. That is why it's important to continuously spread the word about safety tips and smart safety protocols. Whatever your workplace challenges are, make it easy for everyone on your staff, from the bottom to the top, to report safety issues. Address these matters immediately, especially if they will prevent slips, falls, and cuts. Train everyone on how to alert superiors to those issues so that your entire team recognizes the importance of workplace safety. Get the whole staff on board with regular cleanup to avoid the most common types of injuries. The best work safety tips for employees always circle back to self-regulation. Remind everyone about what can happen when staff leaves clutter and debris on the floor. Set up easy protocols for empty box and packing material disposal, so debris doesn’t collect in the aisles. Be diligent about explaining the tripping dangers of out-of-place materials. Check out this article from Safety + Health Magazine, which offers tips for effective workplace housekeeping. Do you have enough roll dumpsters for the busiest times of the day to keep the floor clean? Are your first aid kits fully stocked? When was the last time you tested the fire extinguishers on the floor? Does all of your respiratory equipment fit your staff properly? Is all of your eye safety equipment in good working order? Do you have a sufficient stock of safety utility knives? Make sure you appoint a staff member to check these items at regular intervals. Post checklists for these crucial safety tips for work and establish a review schedule. Remember, most workplace accidents are preventable, but you can’t stop them from happening without established guidelines and documentation. Today, on-site video monitoring systems are not nearly as costly to install and maintain as they once were. Post security cameras throughout your facilities to watch out for potential accidents and spills. Video security also helps you keep a protective eye on new team members who are not as familiar with your on-site safety requirements as the rest of your staff. Cameras also notify you when inventory falls off shelves or when employees have not sufficiently cleared certain areas. Video equipment creates a visual record of any accidents so if they do happen, you can carefully review them to determine exactly what went wrong, giving you greater control over preventing future accidents. If you take as many steps to encourage a safe and secure environment as you do other elements of job training, your whole team enjoys a safer and cleaner workplace. Every staff meeting needs to include training and information that highlights your safety priorities, as well as new safety tips for any changing workplace policies. During meetings, provide employees with articles about warehouse safety to help keep safety subjects top of mind. Create incentives around safety. Did the team go an entire 100 days without an incident? Reward them with a catered lunch, gift cards, or bonuses. Remember, the more they learn and respect how to help themselves and each other, the more you enjoy a cost-effective fiscal year. Go deeper by investing in resources to avoid accidents and injuries that are the most common for your specific industry. You know your workplace better than anyone, so collaborate as a team to get the immediate bases covered right away. Use these easy-to-implement safety tips for work as a foundation for cultivating a productive and healthy environment.